US companies hired 182,000 workers in March, far above the meager 28,000 increase in February, the Labor Department reports. The news triggered a collective sigh of relief by effectively confirming that February's weak gain was noise. The upbeat data translates to a 1.9% year-over-year increase through March, unchanged from the previous month. Based on this trend data, today's report reaffirms what's been clear in a broader review of economic and financial indicators in recent weeks: the probability is virtually nil that a US recession has started. Today's update serves as a reminder that relying on one data point to evaluate business-cycle risk usually delivers misleading results in the extreme. But even if you were inclined to use the disappointing February jobs report as a guide, focusing on the more reliable one-year change still suggested that the economy was expanding at a decent if slower pace. As discussed a month ago, February's stumble in job growth only dented the one-year change in private payrolls, trimming it 1.9% from 2.2% in January. By any stretch of the imagination, a 1.9% annual pace in the labor market almost certainly negates the possibility that an economic contraction is lurking on the immediate horizon. Nonetheless, the clues continue to pile up that the US growth rate will edge down, albeit slowly. 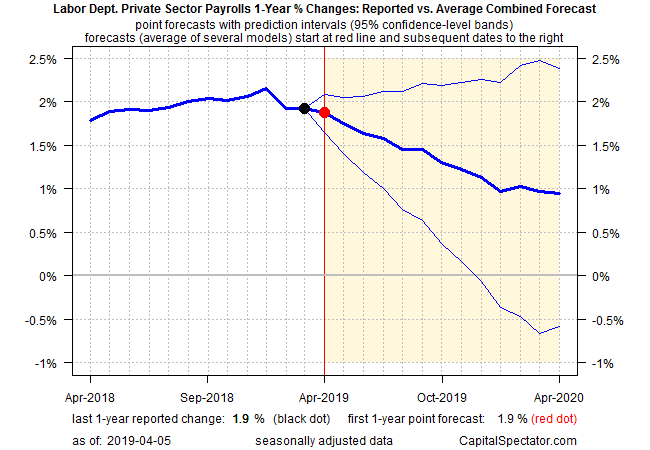 The forecast starts with a fresh run of projections for private payrolls, based on The Capital Spectator's combination-forecast model. Adding today's newly minted numbers to the mix points to a mild but persistent deterioration in the pace of job creation going forward. 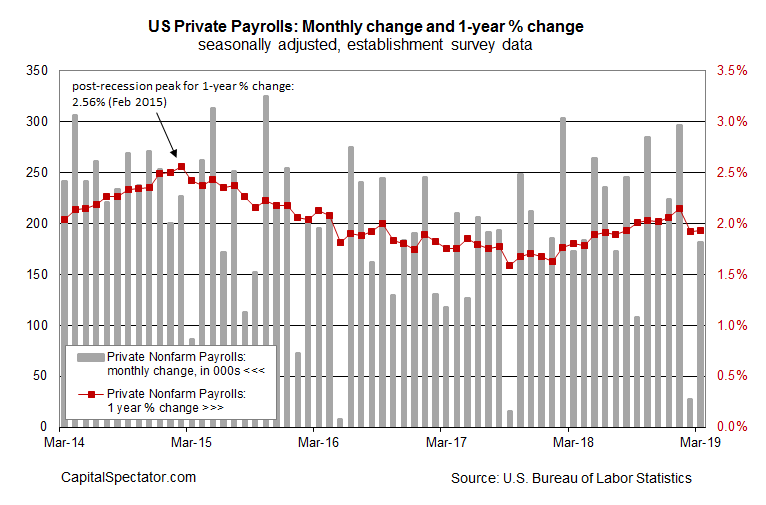 The good news is that the expected decline in the one-year trend for private payrolls is gradual. Barring some out-of-the-blue event, recession risk isn't likely to be a serious threat for the foreseeable future.